But what is Old Florida? For some it is when Spanish conquistadors founded St. Augustine or the rustic pioneer era of the 1800s when cattle ranches spanned the state. But for most, it’s the early or mid-20th century Florida depicted on vintage postcards, a land where trailer-park snowbirds competed in shuffleboard tournaments, kitschy tourist attractions featured alligators and seashell souvenirs, and rustic beach bars drew a barefoot crowd. It was a time when life was slow and mellow, orange trees grew in back yards and family vacations included a motel stay where the kids frolicked in the swimming pool. Those days are gone, but Old Florida has not disappeared. All sorts of genuine Old Florida places and experiences still exist—if you know where to look. And summer, when the crowds are gone and the days can be long and lazy, is a great time to incorporate some vintage Florida into your life. Start by understanding Old Florida is all about slowing down and keeping it simple. Savor a summer sunset, or check into a retro 1960s motel. How about a day of shark’s teeth collecting? Discover pockets of Florida’s past in out-of-the-way towns, state museums, or at a clear blue spring in the middle of a pine forest. From weekend trips to adventures right here in town, we’ve found dozens of ways to bring Old Florida into your summer. Our best sunsets happen in summer. Here’s where to enjoy them. Because of the summer humidity, moisture and clouds, summer is the season of rich, intense sunsets. Skies transform into magnificent soft tangerine and pink colors aswaves wash up on the sand reflecting the setting sun. Sandbars pop up and sand dollars appear in the shallows. Rippling wading pools are left behind by an outgoing tide. There’s no bad place to watch a Sarasota sunset, but if you want to find some places that are less traveled, consider these. An easy walk from Siesta Village, an open expanse of white sandy beach welcomes you for a soul-renewing experience. It’s less crowded than the Siesta Key Public Beach, and families set up picnics as children build sandcastles and run through tidal pools. Shorebirds dine on the outgoing tide. Anglers fish offshore. But precisely when the sun slips under the horizon, most everyone pauses with phones and cameras ready to capture the moment. And if you stay and watch the colors fade and the stars twinkle you may see the nighttime phenomenon of phosphorescence in the Gulf waters. Darting fish, a splashing swimmer, even breaking waves may trigger tiny organisms in the water to glow, leaving a trail of light. At the southernmost end of Lido Key, as far as the road will take you, Ted Sperling Park stretches from beach to bay along Big Pass, separating Lido and Siesta keys. In addition to offering a mix of bay and Gulf environments, this park has picnic tables and hardly ever seems crowded. Pine trees whisper in the breeze above sandy, sunflower-laden trails that lead to the beach. Find a spot to relax and watch nature’s glory. When the show is finished, take a stroll around the point and along the pass to watch boats and birds head home. Along the length of Longboat Key are several beach access points. One in particular, Beach Access 3495, tucked halfway up Gulf of Mexico Drive, is somewhat hidden but worth the stop. A wooden boardwalk through sea grapes, pines and sea oats, and over the dunes, leads to the gloriously wide and usually empty beach. You will feel like it’s your own private patch of paradise. Parking is available. Low-key lodgings that score high on family fun. Nothing beats the laid-back fun of a rustic place on the beach or inland water, and luckily for us, a few old-timey spots survive. This iconic 1960s beach motel operated by the Turner family since 1971 is Old Florida at its most authentic. Multigenerations of families come to get back to basics. Terrazzo floors and Murphy beds keep it simple. Most guests park their chairs at the water’s edge, and enjoy beach walks collecting shells and shark’s teeth. Bargain summer rates start at $77 per night. To end a perfect day, enjoy seafood or a burger at Pop’s Sunset Grill overlooking the Intracoastal Waterway, just over the south bridge to the mainland. On the south end of Siesta Key sits one of our county’s most wonderful assets: a beachfront campground. For tent campers and RVers, the Turtle Beach Campground is a thin slice of paradise shaded under a row of shady pines. Swimming, beach walking, shelling, barbecuing and stargazing are the main attractions. Visitors scan the beach for large turtle tracks leading to nests where mothers have buried their eggs. Summer rates are a bargain, beginning at $32 per day, or $178 per week. There are only 40 spaces, so be sure to call for reservations. Remember when people had the time to linger? You’ll feel like slowing down at the Linger Lodge situated beneath massive oak trees dripping in Spanish moss that shade the restaurant and campground on the picturesque banks of the Braden River. Waterfront RV and tent sites including quaint cabins make this one of Old Florida’s best-kept secrets. East of I-75 and south of State Road 70, this place seems untouched by time. 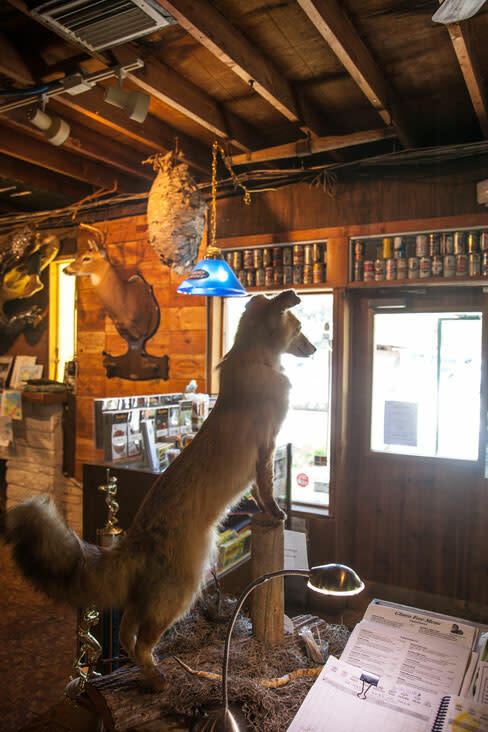 The restaurant is famously decorated with taxidermy specimens and the menu serves hearty “Old Florida” favorites such as fresh alligator bites, frog legs, fried green tomatoes, seafood and BBQ. You may even consider a paddle ride up to the Linger Lodge from Jiggs Landing, an historic fish camp just downriver that recently has been upgraded with new picnic pavilions, a kayak launch, boat ramp, dock and cabins. Jiggs Landing is right on Ward Lake off 63rd Street, in east Manatee County. Jiggs Landing, 6106 63rd St. E., Bradenton, (941) 748-4501 ext. 4602. You don’t have to stay home in the A.C. to beat the heat. Just like the rest of us, fish can be sluggish on hot summer days. So wait until after dark to cast your line in local waters. Jeremy Lee, owner of Lee Side Charters and a fifth-generation Sarasota fishing captain, suggests these spots for good night fishing. Venice Jetty. The outgoing tide on a new or full moon is hard to beat. Osprey’s Blackburn Point Swing Bridge. Fish on the incoming or outgoing tide. The crowds get there early, so arrive in time to claim your place. New Pass Bridge, which connects Lido and Longboat Keys. Watch the tides. Note: Fishing licenses (kids, seniors and a few other groups are exempted) are required. Apply online at MyFWC.com. Long for a refreshing and healthy start to your day? 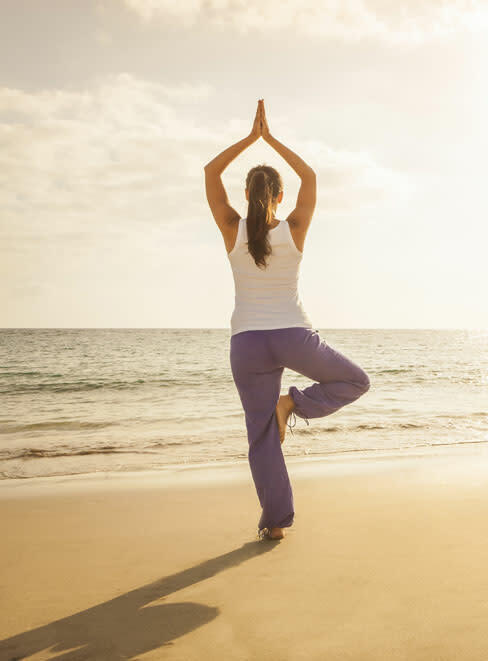 Try an early morning yoga stretch at Siesta Key Public Beach with Ava. The sun is still low in the sky and the Gulf breezes are cool and lovely. Meet at the green lifeguard stand Mondays, Wednesdays, Fridays and Saturdays at 8 a.m. Bring a towel and water. Donations accepted. Ten million years ago, when Florida was submerged under water, swarms of sharks swam over what are now our neighborhoods and highways. Over eons, as the water receded and gave way to land, the prehistoric sharks died off. Their skeletons disintegrated, but their fossilized teeth remained. The Venice coastal area sits on top of a fossil layer that runs 18 to 35 feet deep. With storms and waves, the fossils are slowly driven into the shallow waters and then up onto the beach. Head to the Venice Pier at Brohard Park next to Sharky’s restaurant and take a walk out on the 740-foot pier. Stop at Papa’s Bait Shop. There you can rent or buy a screened basket fitted to the end of a pole that can be used to find shark’s teeth. Or you can just use your hands. Pick up a handful of sand and shells and sift carefully, watching for treasures to fall through your fingers. Tip: Dig down where the curl of a wave is breaking onto shore and get the incoming new shells and shark teeth. Afterwards you can celebrate your bounty at Fins at Sharky’s with a great Gulf view and a well-deserved grouper sandwich. Cool down inside while learning about Florida and its past. Take an afternoon to visit Bradenton’s charming Cortez Village, one of the last remaining fishing villages in Florida. Explore the little streets and admire the vintage cottages and tabbystone homes. Then visit the Florida Maritime Museum, housed in the old schoolhouse. 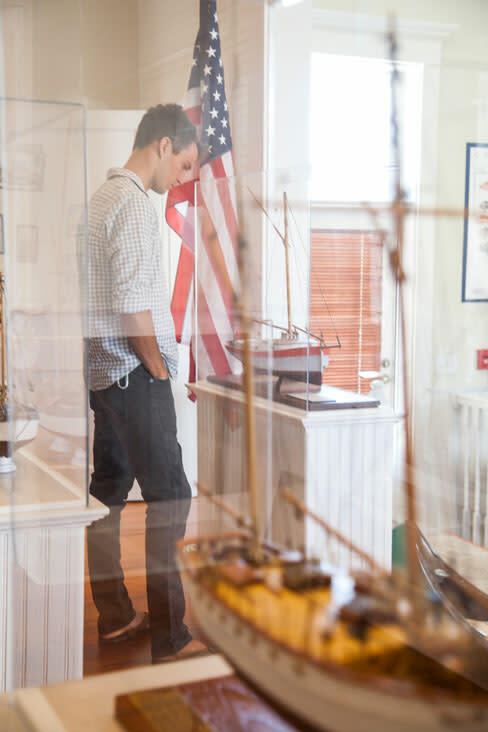 On display are fishing artifacts and relics, historical photos, model boats and exhibits capturing the essence of the village and Florida’s fishing past. Don’t miss the Banks Shell Collection, with hundreds of shells collected by local sea captain Blake Banks, who gathered the colorful specimens in the Gulf of Mexico. For dinner, jaunt over to the waterside Star Fish Restaurant, Tide Tables or Cortez Kitchen, all offering fresh local Florida fare in a gloriously rustic setting. Not only is Bradenton’s South Florida Museum home to Snooty, the longest living Florida manatee in captivity, but it’s also a great place to gain insight into the area’s cultural and historical past. From fossils of the earliest marine and mammal inhabitants to the first evidence of humans in the area, you’ll find exhibits that tell the story of this part of Florida. And if that is not enough, check out the Bishop Planetarium, where a snazzy new digital projection and surround sound system lets you enjoy a dazzling universe above. Summer is hurricane season in Florida, and the best (and safest) way we know to experience one is in Tampa’s Museum of Science and Industry (MOSI) wind tunnel room, where you can see just what howling 75 mph hurricane force winds feel like as you witness the impact of a hurricane’s storm surge and smashing waves. It’s all part of its popular “Disasterville” exhibition, where, through what are called “immersion theaters,” you can experience and understand the force of three other simulated natural disasters, too—earthquakes, wildfires and tornadoes. If you haven’t yet seen work by The Highwaymen, African-American Florida artists who during the segregated 1950s and ’60s were not able to show their work in art galleries and so sold their paintings along the roadside, be sure to catch “Against All Odds: The Art of the Highwayman” at the Tampa Bay History Center. The Highwaymen created classical landscape paintings using available materials to depict seascapes, rivers, lakes and pastures of natural Florida. While at the history center, take a look at the Florida Cracker cabin and the Land Remembered exhibit, based on the iconic Florida book by Patrick Smith. Or hop on a saddle at the Cowmen & Cracker exhibit, which details the Florida cattle industry. July 4 is free at the TBHC, where war re-enactors dressed in period costumes become live historians. Tampa Bay History Center, 801 Old Water St., Tampa, (813) 228-0097. Summer is the season to enjoy this tropical fruit. In summers gone by, stately mango trees all over town were loaded with sweet, ripe mangos. Development and landscaping have taken many of those trees away, but if you don’t have one in your yard—or a generous neighbor’s—you can find many varieties at local produce stands and grocery stores. We asked Kathy Crowley, owner of Sarasota’s Crowley Nursery, about her favorite mango varieties. Carrie: Rich and sweet, with silky flesh, it’s considered one of the best-tasting. And it’s great for planting at home, as it grows to a modest height and is very disease-resistant, requiring minimal care. Pickering: Firm with a slight taste of coconut, it’s also known as the “condo mango” because of its compact six-foot tree size. Miracle (or Choc-anon): With Thai origins, this firm, sweet, golden yellow mango is a favorite of snowbirds, as it ripens in winter and summer. 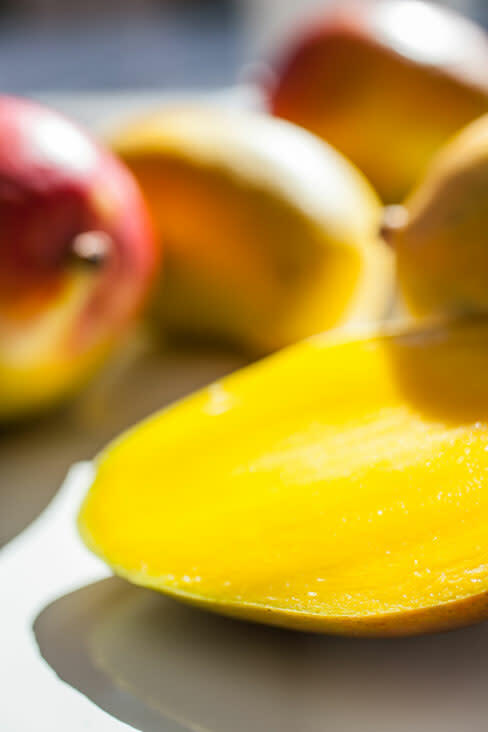 For a tasty summer getaway, head to this annual celebration of the mango. On July 12 and 13, Fairchild Gardens hosts two days of activities, including a mango tasting (450 varieties! ), chef demonstrations, a mango brunch, scientific lectures, kids’ fun and hands-on gardening clinics. Take along a shady hat to explore the gardens, which are lush and beautiful all year round. Break out the blender and make one of the most delicious tropical treats around. Cut up the fruit and place it in the freezer for 30 minutes. Freezing helps thicken the smoothie. Using a blender, blend the fruit and the juices, yogurt, honey and ice. Hop in the car and head to some timeless Florida treasures. What, caves in Florida? Florida is famously flat, but in the Panhandle, northwest of Tallahassee, you’ll find Florida Caverns State Park, where you can tour one of the state’s most remarkable geological formations. And it’s a cool, comfortable 65 degrees inside. A 45-minute cave tour descends deep down a flight of steps that is moderately challenging but not difficult. The passage is lit intermittently throughout the walk. Beautiful stalagmites, stalactites, soda straws, columns, rimstones, flowstones and draperies are evident throughout the cave. Park rangers point out interesting geological formations with names like The Wedding Cake and The Cathedral. In the shallow bays off the coast, from Homosassa Springs to the Florida Panhandle, summer is scallop season. The nearest place for us to experience scalloping is Citrus County, north of Tampa. Each summer the region bustles with recreational divers in search of the tasty mollusk. Scallops have grayish shells and can fit in the palm of your hand. They sit upright within the blades of sea grass. Royal blue eyes peer out from the narrow shell opening and become easy to spot as you swim or snorkel over the grass flats in 3 to 8 feet of water. Once you’ve spotted a scallop, it’s a simple scoop and into your bag. But be forewarned, the more you catch the more you’ll want! To get out to the scalloping grounds you will need a boat or a guide. From the docks of Homosassa Springs or Crystal River, guides will transport you out to the prime locations in Crystal Bay. Once there, you will join a flotilla of watercraft and colorful party boats amidst floating dive flags. Snorkelers outfitted with masks and fins splash about scanning the water for the prized scallops and one thing is for sure, tonight’s dinner is on everyone’s mind. Plan ahead, as scalloping season gets busy. Mid-week is the best time to go to avoid crowds. Two gallons per person is the limit and once back on the docks, for-hire scallop cleaners will have your catch ready to cook. Some local restaurants will even cook them for you. Scalloping two-day packages are available from local hotels, including Plantation on Crystal River, where packages starting at $558 include a two-night stay with breakfast, guided scalloping trip and a dinner—the restaurant will cook your catch. Or you may go on your own. The approximate rate for a guided trip is $75 per person via pontoon boat for a four-hour morning trip. All gear (masks, snorkel, fins, gloves, scallop bag) is included. It’s good to have an experienced fishing captain familiar with the area; one is Captain Cindy at Majestic Manatee Tours. 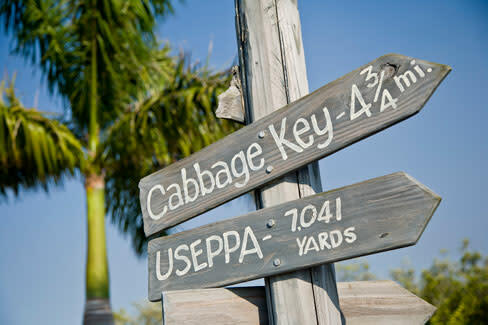 Said to be the place that inspired Jimmy Buffett’s song “Cheeseburger in Paradise,” Little Cabbage Key is 20 miles northwest of Fort Myers in Charlotte Harbor with a restaurant, bar and inn situated on top of an ancient Calusa Indian mound. A quick boat ride from Pine Island will get you there. And once you arrive, you’ll notice little has changed since 1938 when mystery writer Mary Roberts Rinehart purchased the picturesque property surrounded by clear waters and mangroves, and covered with royal poinciana trees. Ospreys and bald eagles soar overhead. Walk around the island, climb the old water tower and if you feel you can’t leave, stay the evening at the inn or one of the old cottages, where you’ll likely catch a dazzling display of nightblooming cereus. Tropic Start Day Cruises’ ferry leaves from Bokeelia, on the north end of Pine Island. The tour includes a lunch stop at Cabbage Key and then a visit to nearby Cayo Costa Island State Park known for its world-class beach and shelling. If you just want to go for lunch, consider the Island Girl, a taxi service from Pineland to Cabbage Key. Splash in a Florida spring. When summer temperatures start to climb, it’s time to head to one of the state’s 700 springs (the largest collection on earth), which pour out eight billion gallons of shimmering aqua-hued water each day at a constant, cool 72 degrees. 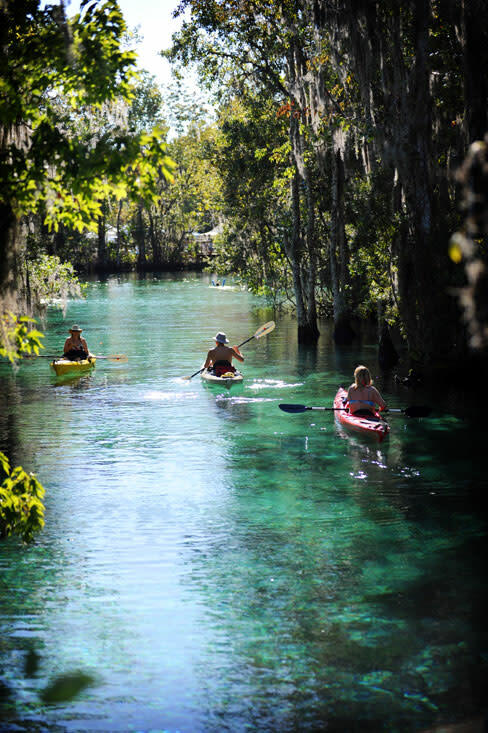 Most of Florida’s springs are just a day trip away and are located within state or national parks. This keeps the entry fee very reasonable, making the experience not only fun, but one of Florida’s best bargains. Here are three popular springs that will help you “chill out” this summer. Rainbow Springs State Park, located southwest of Ocala near Dunnellon, has enjoyed a reputation as a scenic and popular playground since opening in the 1930s as a family-owned amusement park. Rainbow Springs later became a state park and has been called Florida’s natural swimming pool. The white sandy bottom lies between areas of smooth limestone creating a “pool–like” effect. But in this swimming pool you will share the water with turtles as they sunbathe on fallen logs and see blue herons and white ibis feeding along the riverbank. Crystal River is located on the Gulf coast in Citrus County, promoted as Florida’s “Water Lover’s Paradise.” An abundance of freshwater springs flow with pure, clean water throughout the region. To visit this spring system, you’ll have to go by boat. Local outfitters will take you to the springs where a beautiful world, on or below the water, awaits. Location: The City of Crystal River is on U.S. Highway 19 about an hour north of the Clearwater-St. Petersburg area. Several outfitters are available through the Citrus County Convention & Visitors Association website, VisitCitrus.com. Located northwest of Gainesville near Fort White, the Ichetucknee Springs (nine total) and River have long been a destination for Floridians seeking the delightful experience of floating down the six-mile river before it empties into the Santa Fe. From late Memorial Day until Labor Day, Ichetucknee Springs State Park resembles a bustling summer camp. Visitors camp, hike, picnic, snorkel and tube. Families and larger groups raft and tether their tubes as they float down the river. Still, in some areas, you will have the river all to yourself. And everyone on the river gets to enjoy one of Florida’s most authentic pleasures.